1. Heat a good layer of oil in a large casserole. Gently fry the carrots until they are starting to colour, then remove and set aside. Season the ox cheeks. Add a little more oil to the pan and fry the cheeks, in batches, until browned all over; remove and set aside. 2. Discard most of the oil from the pan then add the onions and celery and fry for 15 minutes until tender. Add the herbs, garlic and peppercorns and return the cheeks to the pan. Add the sherry, bring to the boil and bubble briskly for 5 minutes. Add the stock and reduce the heat to a simmer. Cover and cook for 2 hours- 2 hours 30 minutes, until the meat is tender to a spoon. Return the carrots to the pan; cook gently, uncovered, for 30 minutes or until the meat is falling apart and the sauce has reduced. 3. For the spinach, heat the oil in a pan and gently fry the shallots until softened – about 10 minutes. Add the pine nuts and sultanas; cook until the nuts are light golden. Add the spinach and allow to wilt. 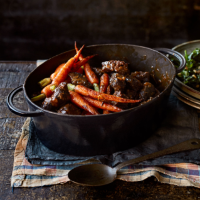 Season and serve alongside the stew, with mashed potatoes or crusty bread, if liked.